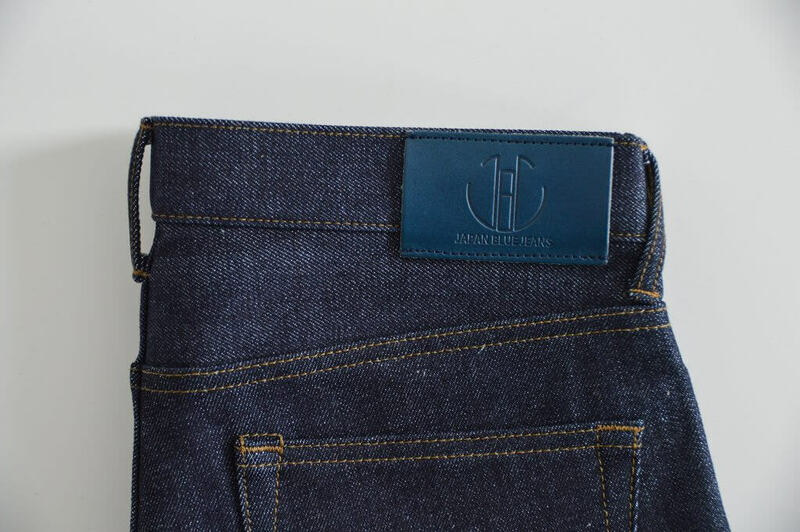 Japan Blue Jeans was founded by the Japan Blue Company in Okayama, Japan five years ago. 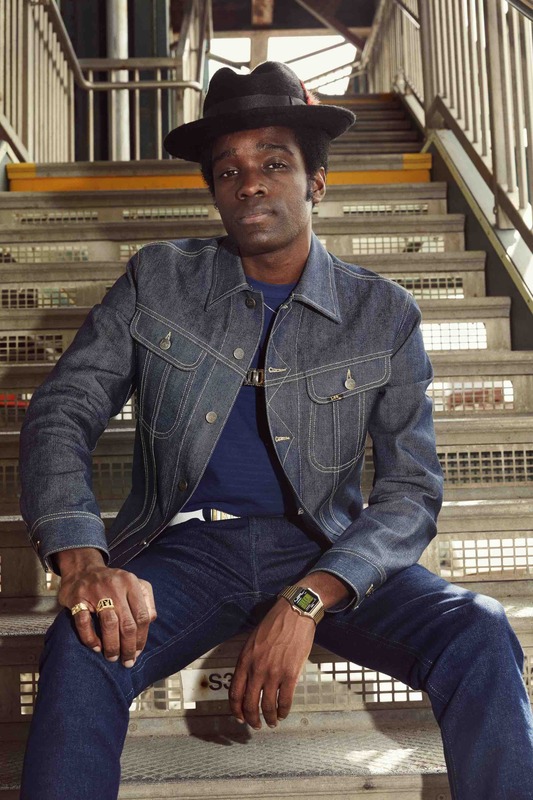 The Japan Blue Company is one of the most popular denim companies in the world and is also founder of Momotaro Jeans, Soulive and the denim mill Collect Co. 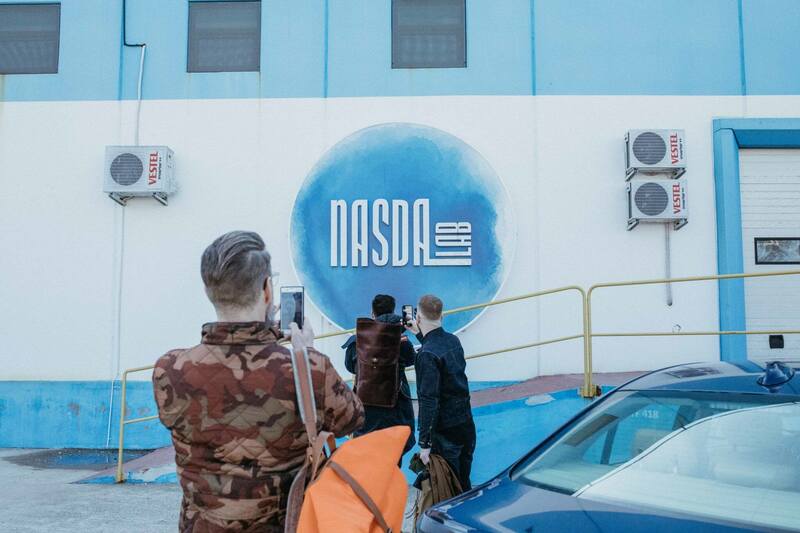 The company started as a weaving company in 1992 and evolved to a gathering of leading denim brands, among which, Japan Blue Jeans. Learn more about Japan Blue Jeans and read our interview with Kishimoto, managing director of Japan Blue Jeans. The Hi-Tapered model of Japan Blue is a result of feedback, received from their European and American customers. In comparison with the JB04XX fit, the hi-Tapered fit is a more relaxed cut. The fit provides more room in the top block, thigh and hip. It also features a higher rise and it will taper down from the thigh all the way to the leg opening. Because of the extra room in the top block, you can move freely and comfortably while fading a 14 oz. pair of jeans. Just as we have come to expect from Japan Blue Jeans, the JB0606 Hi-Tapered is solidly constructed from high-quality materials. The jeans is stitched with a strong tobacco yarn and strengthened with antique gold colored rivets. 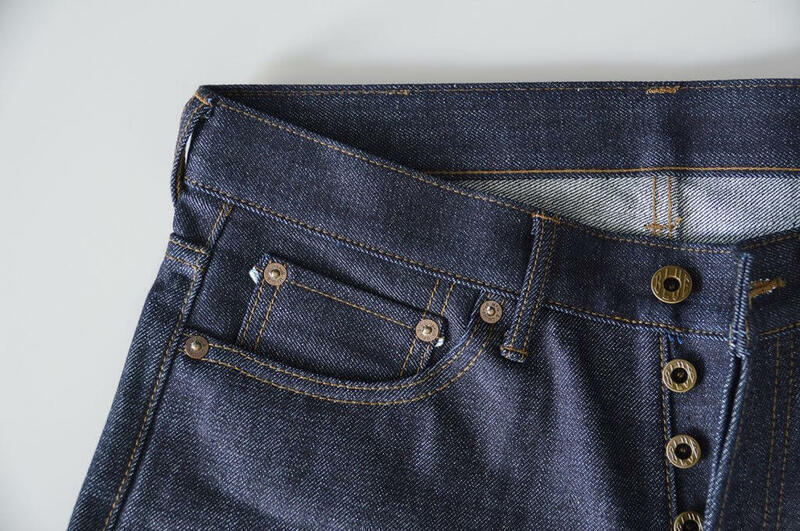 The JB0606 features the typical Japan Blue signature details like a button fly with 5 brass buttons, Hickory stipe pocket bags and a hidden selvedge on the coin pocket. The patch is made of Italian vegetable tanned leather and was designed in Japan. Vegetable tanned leather is the eco-friendliest way of tanning leather because no chemicals are used during the process. This type of leather is incredibly strong, durable and will age over time. When the jeans will start fading, the leather patch will darken due to sunlight and being worn. 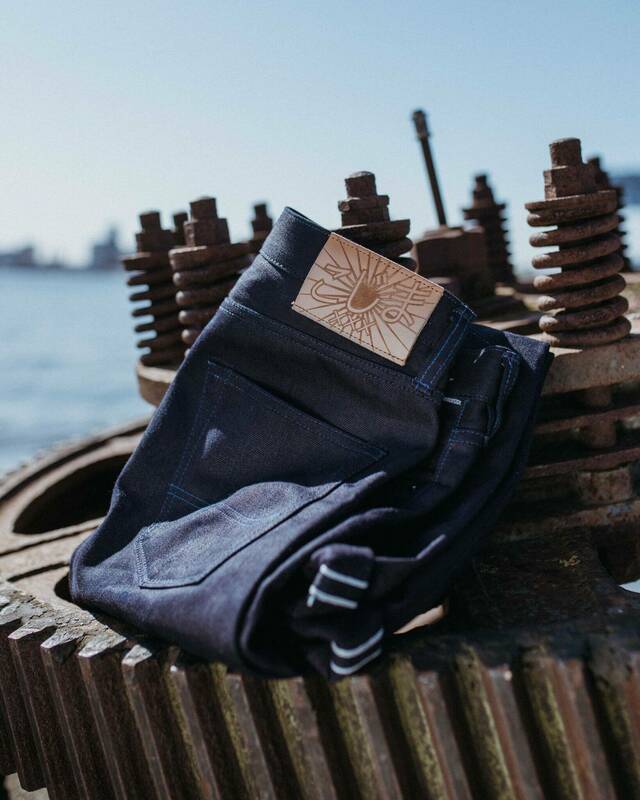 The pocket bags of the JB0606 Hi-Tapered are made from 100% cotton. The bags are thicker compared to most pocket bags and therefore stronger and more durable. The pocket bags are featuring a pattern made with the traditional Japanese folk embroidery called ‘Sashiko’. The jeans is finished with antique gold colored buttons and rivets. Both the buttons and the rivets are made of Brass, a metal alloy of copper and zinc and display a Japan Blue Embossing. The production of the JB0606 Hi-Tapered took place in Kojima, a small city in the Okayama prefecture in Japan. This area is considered to be the promised land when it comes to denim production and construction because all major Japanese denim brands are producing here. The Japan Blue Company is well represented in this area, since all their weaving and production take place here. 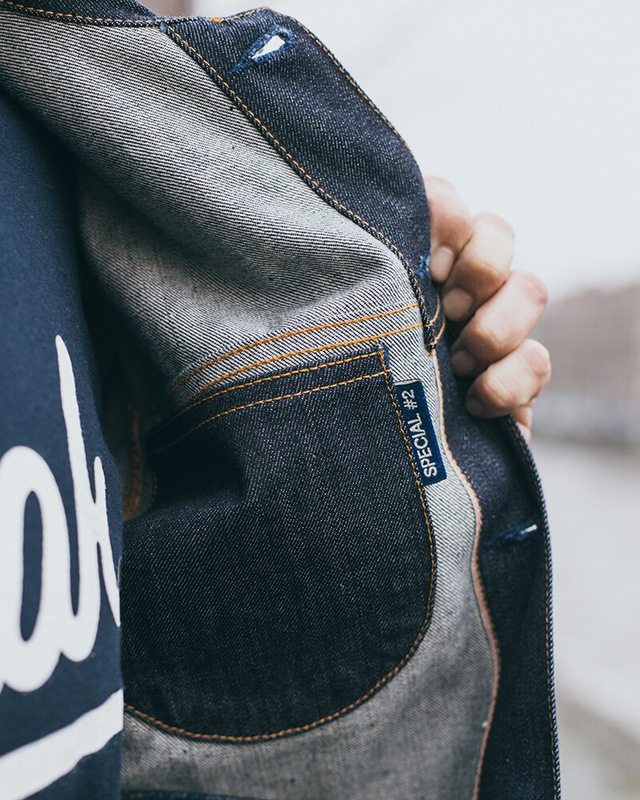 Everything, from weaving the fabric to finishing the jeans is done in-house by Japan Blue. This is truly unique, since most denim brands haven’t got the capability to weave the fabric their selves. Japan Blue uses the rope Dye method to dye the yarn, which will result in an indigo dyed surface while the core of the yarn will remain white. The fabric is woven on vintage shuttle looms to create a fabric with character and unevenness on the surface. After the fabric is being woven, the jeans are sewn on vintage sewing machines. 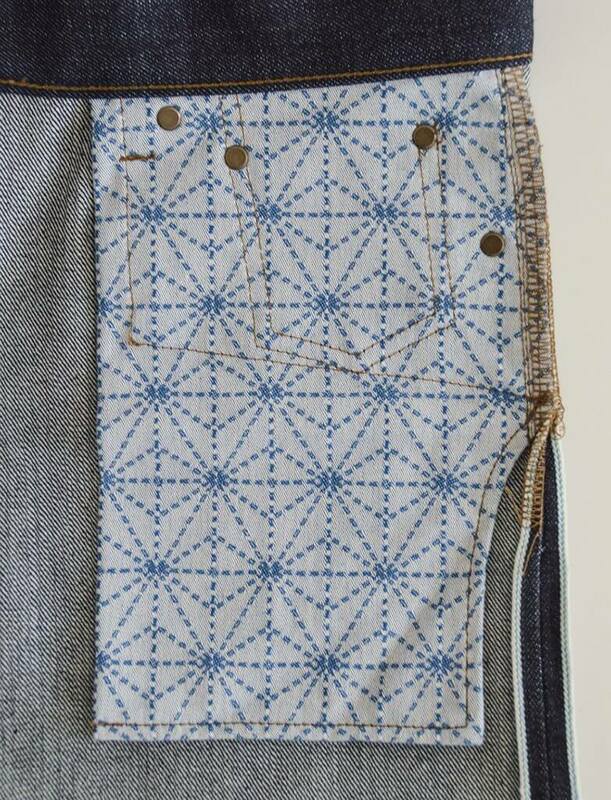 The JB0606 from Japan Blue is made of 100% cotton and features a light blue-line selvedge ID. The fabric is made from a blend of a Zimbabwean cotton warp and a Memphis cotton weft, which is a unique combination. Zimbabwean cotton is known for its softness and brightness while Memphis cotton is tougher. Combining those two types of cotton results in a comfortable and soft pair of jeans, while retaining their tough feel. Wearing this type of fabric will result in deep contrast fades. As mentioned before, the patch is made of vegetable tanned Italian leather and the buttons and rivets are made of Brass and antique gold colored. 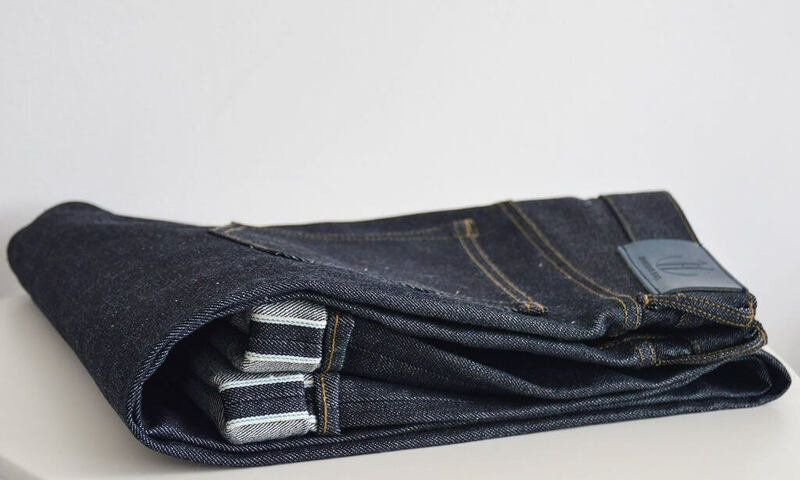 Just like every other pair of raw denim, we advise you to wear your jeans as long as possible before being washed for the first time in order to create deep contrasting fades. 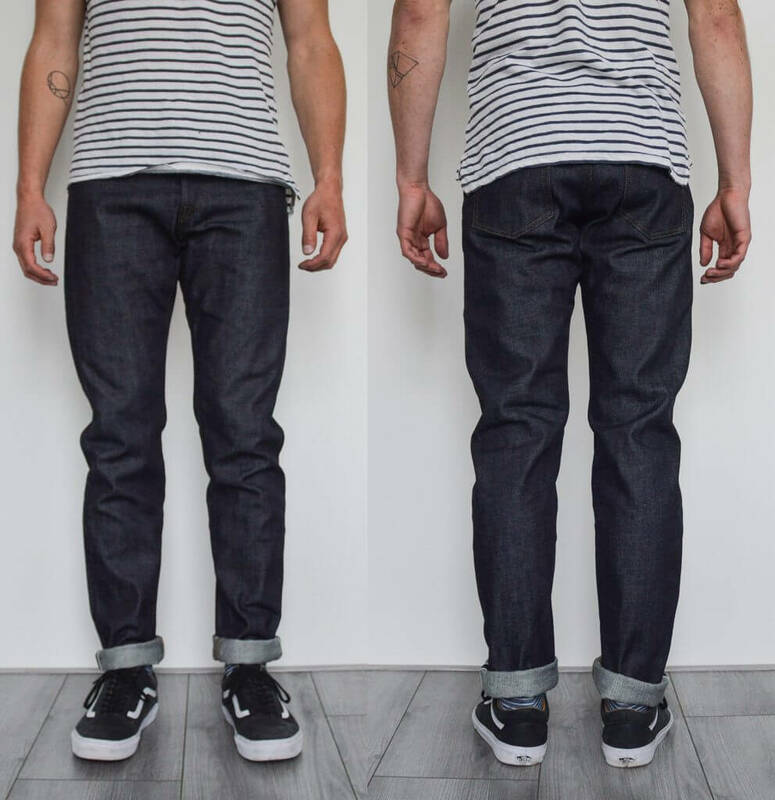 Washing your jeans earlier will create a clear even blue tone, which might also be beautiful. When the washing cannot wait any longer, we advise a hand wash and therefore as a result minimal damage to the fabric. We do not encourage not washing the jeans at all. Washing it every once in a while will help recover the fibers, giving your pair of jeans a longer lifespan. The fabric of the JB0606 Hi-Tapered is sanforized, so minor shrinkage is expected after being washed for the first time. And because the fabric is sanforized, an initial soak is not necessary. The JB0606 Hi-Tapered is a result of Japan Blue listening carefully to their customers. This cut is their answer to the current need for more comfort on the market, while staying close to their vision and heritage. This cut provides more room, comfort and the ability to move, even with a 14 oz. non-stretch fabric. The jeans is solidly constructed of high-quality materials and finished with materials that are aesthetic as well as durable. The fabric is woven from a combination of Zimbabwean cotton and Memphis cotton in order to make a soft and comfortable fabric with a tough feel. Because Japan Blue used the Rope Dye technique to dye the fabric, it will fade fast. We can recommend the JB0606 Hi-Tapered to all of you who are looking for a more relaxed fit. After reviewing this pair of jeans we can honestly say that the fit, the details, the fabric and the constructing are top notch. The Japan Blue JB0606 Hi-Tapered comes at a price of $200, which is in our opinion very reasonable. The jeans is available at Blue Owl.